Looking to blow off some steam with guns blazing? Wait no longer. Now you can get your hands on the 80’s-themed action game Tango Fiesta. London-based Spilt Milk Studios (Crunch: The Game, Hard Lines) have partnered with publisher and distributor Mastertronic (Dream, Transport Tycoon) to bring the British developer’s creation to the public. The co-op shooter, Tango Fiesta, has evolved from Steam Early Access to a legit, full edition for PC and Mac. In Tango Fiesta, you get to play as one of six characters. As the constantly shirtless commando John Strong, you’ll start off reminiscing about your younger 1980s self, who fought wars for freedom. That’s until a General Quentin informs you that your fiance, Chenny (the president’s daughter), has been kidnapped by the malicious Gordon Bennette. The archenemy’s not asking for a ransom, but for John Strong to kill himself. Thus, to rebel, John Strong fights through a swarm of Bennette’s “generic goons” to save his girl. Throughout Tango Fiesta, the story unfolds through witty and chuckle-some narrative, where it flashes back and forward in time. However, the in-game dialogues feel too drawn-out despite the script being humorous; skipping them may be an inescapable option. The game freely pays tribute to some of the 80s’ classical action flicks by embedding references to them in-game. In Tango Fiesta, you can also play as the afro-clad MacMillan, the rugged Miller, the armored Bionic Cop, the fierce Conchita, or Dr. Henk, the parapsychologist. Two words describe the artistic design of Tango Fiesta characters and maps – quirky and crazy-colorful. Sadly though, the UI seems to have primitive inconsistency issues such as overlapping icons and text. The game menus seem quite underdeveloped, lacking the clean, sleek design you’d expect in a game fresh out of the Early Access oven. The in-game response time is also pretty disappointing. There are times when you will wait approximately 5 whole minutes for the game to quit, and sometimes for over 30+ seconds for your mission to start. Dialogue sequences tend to have subtle lags, as well. As for the sound design and music in Tango Fiesta, it has proven to be a bit of a muddle. What’s aggravating is a few audio crackles that can be occasionally heard in the background while playing through the missions. Moreover, the typewriter sound effect (mixed with the prolonged dialogue sequences) is so irritating it tempts you to skip said sequence altogether. Additionally, the rather thundering announcer VO at the beginning of each mission feels unfiltered. 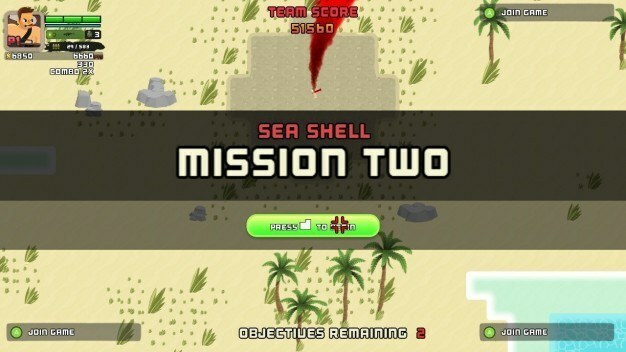 Luckily enough, the music tracks – despite being too repetitive – manage to pull off matching the in-game feel, blending Sax-infused music, and more, with gunshots and detonations. 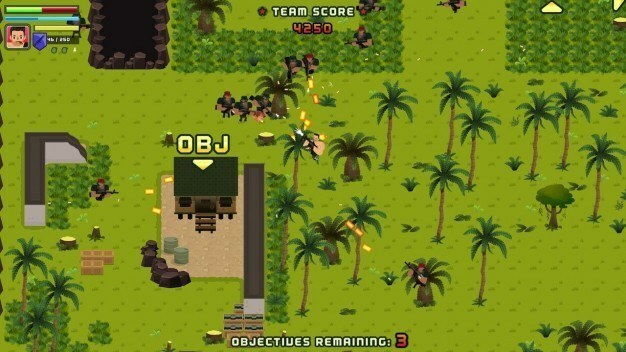 As you start playing Tango Fiesta, it might remind you of the stupendously ‘Murican Broforce, with gameplay similarities to the aesthetically pleasing Relic Hunters Zero. This may infer that Tango Fiesta lacks some authenticity of its own. In fact, playing it felt more frustrating than fun to play. 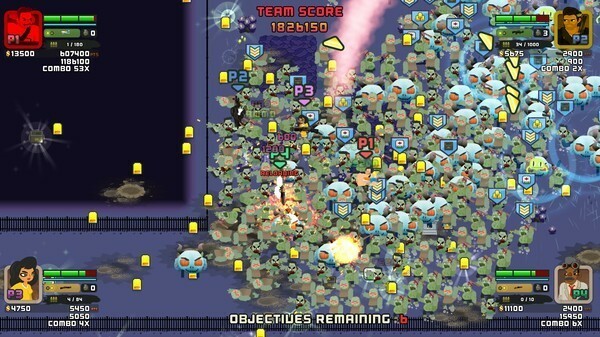 The single player mode had two major sources of frustration: the insanely high enemy respawn rate, and the post-objective bonus wave. That wave is not exactly a bonus one; it’s actually mandatory for you to pass the mission even after meeting objectives. The point of it is having too many enemies for you to mass kill. If you die in the survival round, you repeat the mission. As for the online multiplayer mode, it barely even exists; the multiplayer lobby would have no games to join most of the time. In Tango Fiesta, you get to purchase primary and secondary weapons using gold collected during missions. Weapons include the long-ranged Oozy 9mm, the highly-damaging 12 Gauge, grenades, and more. Despite the variety of weapons, aiming them is infuriating at times; where you aim is not necessarily where your guns end up shooting. Praise the Lord for the existence of traditional, easy-to-use key bindings on Tango Fiesta. Tango Fiesta is admittedly amusing, thanks to its tongue-in-cheek take on the classic tropes of 80s action films. But good writing alone doesn’t make a good game. 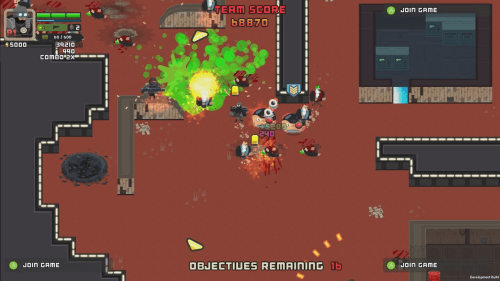 Despite being out of Early Access, it could still use major tweaks – to the glitchy user interface, the godforsaken time lags, gun aiming, and the veritable ghostland that is multiplayer – to be a truly heroic twin-stick shooter. All said tweaks could reduce its analogy to other games and maybe add more fun to its own vital force.